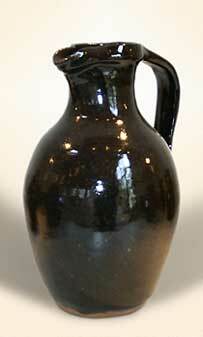 Corser jug - 12" (304 mm) high. 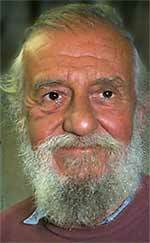 Trevor Corser was born in Lancashire in 1938. His introduction to the world of pottery was when he started working as a general assistant at the Leach Pottery in 1966. He soon became interested enough to want to learn to pot, and was accepted as a trainee. He has remained at the Leach Pottery until 2006 when it was closed for refurbishment, and is now working at Gaolyard Pottery in St Ives with with John Bedding. His work, mainly stoneware with rich glazes, reflects the influences of his teachers. In 1920 Leach and Hamada made the journey half-way around the world to set up a pottery at St Ives in Cornwall. St Ives had long been an artists' colony, and the pottery was built with the aid of a grant from the Handicrafts Guild. The first kiln, which was wood-fired, was made with three climbing chambers, each six feet high, six feet wide and four feet deep. This was the first of its type to be built in Britain, and was a disaster. In 1922 Leach had to ask Tsuronosuke Matsubayashi to come from the Asahi Pottery in Japan to re-build it. Matsu stayed for two years and was a tremendous influence on the St Ives potters. His knowledge of the chemistry of ceramics was a great help and something of an innovation to Leach who had been concerned primarily with the aesthetics of pottery rather than the technical aspects. Leach and Hamada were like-minded and worked and relaxed well together. Their ideal was a fusion of arts-and-crafts principles and a desire to make pots of classic, simple beauty. Early English and Eastern designs in pottery were their paradigm. The early years were fraught with failures. Many firings were unsuccessful, and expenses were high. There was also a lack of acceptance in many quarters of the work, which often appeared crude by the standards of the day. Even so, there were successful exhibitions in St Ives and in London, and many pots found an eager welcome in Japan. Hamada returned to Japan in 1928, but frequently visited St Ives. The pottery was home to a succession of students and apprentices that almost comprise a complete who's who of studio pottery, Michael Cardew heading the list. Every student and apprentice was taught that his first aim should be to throw to a standard; to be able to execute repetitive work accurately. Only when this was achieved, said Leach, could a potter call himself a thrower rather than an improviser. Leach's sons, David and Michael learnt their craft at the Leach Pottery before taking part in regular production and management. The post-war years brought more success and critical acclaim, perhaps helped by Leach's writing. He continued potting until 1972 with the help of William Marshall, his very first apprentice, and died in 1979. The pottery remained open under the direction of Bernard's wife, Janet Leach. After her death in 1999 it was bought by businessman Alan Gillam, owner of the Western Hotel in St Ives. Trevor Corser and Joanna Wason are the main potters. The Pottery Cottage, next to the pottery, is now open as a museum, showing many examples of work of the fine potters who have contributed to the astounding reputation of the Leach.